Rafah residents hand out candy following murder of parents, three children in West Bank settlement of Itamar. Palestinian PM denounces act, says "we categorically oppose violence and terror, regardless of victims', perpetrators' identity"
Residents handed out candy and sweets, one resident saying the joy "is a natural response to the harm settlers inflict on the Palestinian residents in the West Bank." Meanwhile, Palestinian Prime Minister Salam Fayyad said he "clearly and firmly denounces the terror attack, just as I have denounced crimes against Palestinians. "We are against all types of violence," Fayyad said during a tour in Bethlehem. "Our position has not changed. As we have said many times before, we categorically oppose violence and terror, regardless of the identity of the victims or the perpetrators." IDF and security forces have been scouring the West Bank area since late Friday night, and have arrested 20 Palestinians from the villages of Awarta, Zababdeh, Sanur and Siliya. 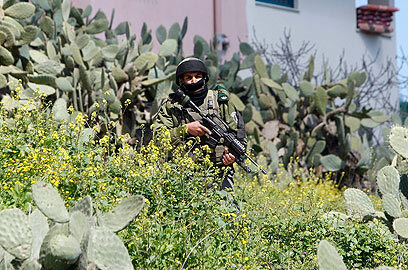 The IAF employed unmanned aerial vehicle in an effort to search for the suspects. The Hamas movement accused the Palestinian Authority's security apparatus of arresting three of its activists near Qalqilya and Jenin. "The report of five murdered Israelis is not enough to punish someone," said Hamas Spokesperson Sami Abu Zuhri, adding, "However; we in Hamas completely support the resistance against settlers who murder and use crime and terror against the Palestinian people under the auspices of the Israeli occupation soldiers." A pamphlet distributed by the Islamic group said the PA also detained activists from Nablus, who were previously imprisoned and released. According to an unverified report, Fatah's military wing – the al-Aqsa Martyrs' Brigades – claimed responsibility for the attack. A group spokesman told a Palestinian news agency that a terror cell infiltrated the settlement of Itamar and committed the attack. The spokesperson stressed that the attack "came as a response to Israel's continues hostile policy toward the Palestinian people." Defense Minister Ehud Barak convened an evaluation session at the Defense Ministry offices in Tel Aviv following the attack. The meeting was attended by IDF Chief of Staff Benny Gantz and other military and intelligence officials. Barak called on the leaders of Jewish settlements in the West Bank to act responsibly and urged the Palestinian leadership to denounce the attack. Ron Nachman, mayor of the city of Ariel, arrived in Itamar Saturday noon and expressed anger over the government and defense minister's conduct. Nachman refused to comment on future "price tag" operations of radical rightist, saying: "I am not responsible for violent acts from either side." See all talkbacks "Gaza celebrates; Fayyad condemns terror attack"